You can certainly do that, but your car is completely wrapped to keep the finish nice and new while it luxuriates at the VPC Spa. Your problem is not with MBUSA. It's with the US govt. with their certification problems. Well... don’t get me started there... I could go on for days! My only issue is why didn’t MB submit the cars sooner? Many other brands which had engine changes have already hit the market for sale... they obviously thought ahead so their cars wouldn’t be delayed. If you didn't have a "delivery by" date in your contract, don't fret about something over which you have no control. Your 2019 car will arrive before 2019. Once you get behind the wheel of your beautiful new E450, the pain you're suffering right now will become a distant memory. Yes it will! From one person born without the patience gene to another, just relax and stop worrying about something you simply can't control. You will SO LOVE your new car when it comes that this just won't matter in the total scheme of things. Correct. Then the supplier and ordering system issues happened, and now wham they're sucking wind in sales. August is going to be brutal I bet. Last edited by sackboydad; 08-06-2018 at 06:52 PM. Historically new cars in the US are first offered in the Autumn. What is there to figure out? A key supplier had a fire which affected production of their SUVs and their ordering system took a crap for like 5 days. Things happen. They'll pay for it a while in reduced sales and likely fall behind BMW YTD, but they'll bounce back. The next model year cars don't usually come out until fall or late summer anyways so there really isn't delay, because under normal circumstances dealers would still have plenty of 2019s. That said, if they're smart they're scrambling behind the scenes now to get the 2019s released to dealers. Either way August sales are going to be a bloodbath. Well, I did my part and bought a new E400 on August 4th. Congrats. What did you dealer say about inventory if anything? My dealer is a large volume dealer, so they still have a lot of stock available. Somewhere in the 50+ range just for E Class. 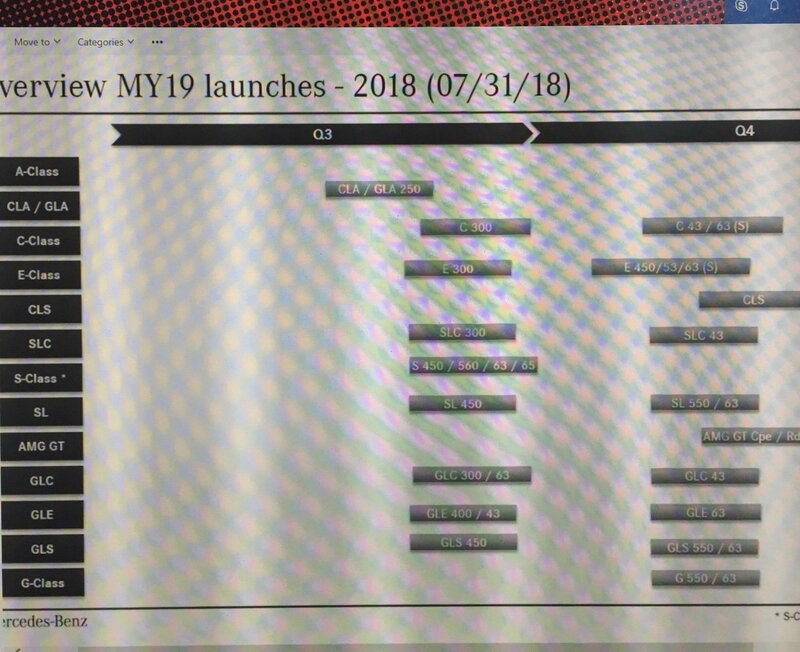 They said the 2019's won't be released until the beginning of the 4th quarter, which is honestly the time frame the new year cars are typically released. I know people are having an issue knowing their cars are built and sitting at the VPC, but the reality is this isn't all that unusual. At least not for Mercedes. I agree with you though. August sales will likely bite them hard, then they'll move a LOT of inventory in the 4th quarter. You're right last month's issues had nothing do with cars already built and sitting in the port, so that should tell you that delays are a normal thing. It happens every single year with all import brands. They aren't screwing anyone and clearly no cars are rusting away anywhere. If a Mercedes can't sit outside for a while then there is a far more serious problem.........in Germany. Cars are usually wrapped during transport anways. Yeah I think it's a case of knowing too much IMO. It creates a "problem" when there really isn't one in most cases. They have delays every year, especially after the whole VW debacle. You're right Mercedes has usually released the next model year's cars over late summer and early fall. Some cars models like the AMG GT 4-door wont' arrive until January. Yep, the cars are completely wrapped during transport. From past experience they arrive at the dealership mostly wrapped still to ensure rocks don't damage them during the truck ride from the VPC to the dealer. Got this from another thread here. Looks like a few days ago. Looks like people buying the E Class are getting bent over the table big time. Latest DOG has E450 Cab as Q3. This now shows well into Q4. I guess if id spent another $100K on an S Class I wouldn’t have to wait as long. Silly me. Thanks a a lot MBUSA. A**holes. Are you sure you're equipped to handle this mentally? I've known for some time E450s wouldn't be released until Q4. I too had ordered one, but decided I just didn't want to wait and picked up a brand new 2018 E400 it's in my garage and I'm enjoying it a lot. What did I sacrifice in doing so? Not that much really. No, I didn't get the cool all digital instrument cluster, but TBH, it's not that big a deal. I also gave up 33 HP. The 400 is all the engine I could hope for and then some. The day I need to get up to 60 MPH faster than 5.2 seconds likely won't ever come. And I gave up some semi-autonomous driving features like Assisted Driving Pilot that I likely would never have used or trusted anyway. Otherwise I got pretty much the features that really mattered to me and I saved a LOT of money getting an end of model year new car. Far greater discount than people could imagine. I get that your posts are your way to vent your frustrations, but they won't help you get you car sooner and in reality, MB isn't bending anyone over the big table to begin with. They will be released when they release them and not a minute sooner. Last edited by rbrylaw; 08-13-2018 at 01:46 PM. E300 and GLC300 have both been certified as of today... they finally coming along.. once this is done.. reality is anything can happen. Expect worse, hope for best.